The Du Vin Group is expanding. And fast. The first stand alone restaurant opened in Clerkenwell at the beginning of the year and now, opposite the sumptuous Dean Street Townhouse on Dean Street, the second stand alone bistro from the Du Vin group stands proud. I entered and walked past the cosy pewter topped bar and booth seating through to The Salon at the back to meet the group that I would be dining with. I was invited along with a few fellow bloggers to sample the menu. I was pleasantly surprised to find a large venue with high ceilings and a New England style decor. The open plan kitchen is enticing and the many empty bottles of wine that decorate the room add to the bistro atmosphere. We started the evening with a Chase Summer Berry Fruit Punch (£9) before moving over to our table. I perused the menu and was fully aware that I could roll out of there if I wasn’t careful. So I opted for 4 Maldon oysters (£3.50 each) to start, followed by the 250g Galloway & Short Horn Cross Fillet Steak (£30). 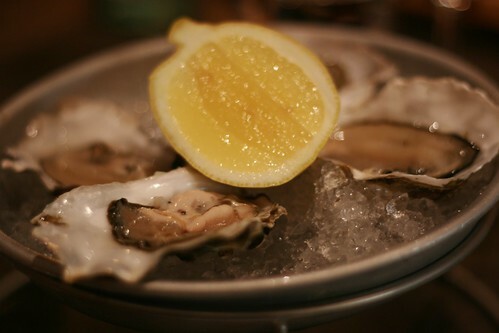 The oysters were delicious but I feel I got a bit of a raw deal with the size – they were tiny. Still, it left lots of room for my steak. 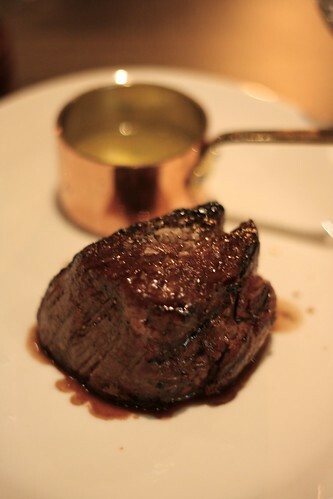 Cooked on the very fashionable Josper Grill, my medium rare steak was a thing of beauty and was quickly devoured. The menu is simple but all dishes comprise of fantastic quality ingredients cooked very well. The emphasis is on locally sourced seasonal produce, which is why the menu will change regularly. Bistro du Vin is the very heart of the ‘Homegrown & Local’ ethos that is employed by all Hotel du Vins across the country. The sides were also delicious – my favourites being the velvety smooth, utterly creamy mash potato (£3.50) and the heritage tomato and red onion salad (£3.50). The green tomato on my plate was a thing of beauty. 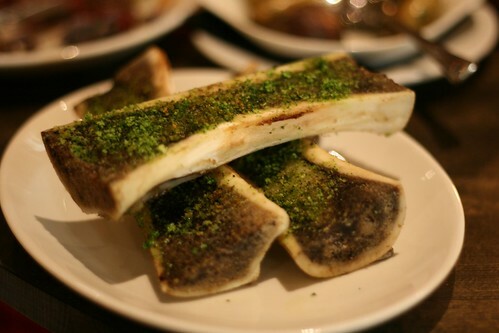 I can’t remember who it was but someone suggested that we get a couple of portions of bone marrow (£3) to share. I’ll try anything so I was game. The only bad thing was I was pretty full so the richness of the dish was a little too much for me. That’s not to say I didn’t like it – I think I would have preferred it if I hadn’t have eaten a huge steak before hand. 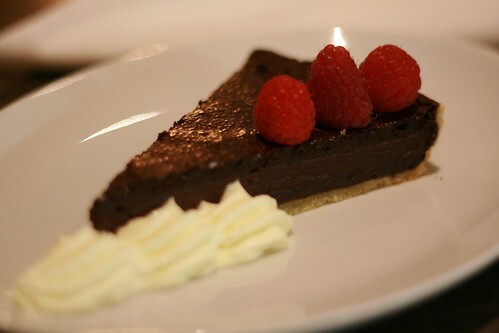 The dessert menu came and I was so very pleased to see chocolate tart with Chantilly cream (£6.50) staring out at me. The Belgian waffle also looked like it would go down a treat but in the end the chocolate tart won out. While we waited for our desserts, we were treated to a tour of the delicatessen style Cave au Fromage, which is run by Eric Charriaux of Premier Cheese. In the beautifully designed walk in fridge is a range of 70 cheeses, which have been carefully chosen from a range of over 600 and will change seasonally. Eric asked us if there were any cheeses that we did not like and I put my hand up and said that I don’t like blue cheese. I’ve only ever tried a few but have been disappointed each time. So of course Eric made me try one of his blue cheeses. I put it up to my mouth, took a small bite and was pleasantly surprised. It wasn’t like the bitter ones that I have had in the past – it was creamy and quite enjoyable. I flitted between the cheese and my chocolate tart. The pastry was rich, crumbly, thin and utterly buttery. The chocolate rich, bitter, creamy and topped perfectly with three fresh raspberries and a line of Chantilly cream. I am not by any means a cheese connoisseur but I can say that the goats cheese with saffron honey was a hi light. 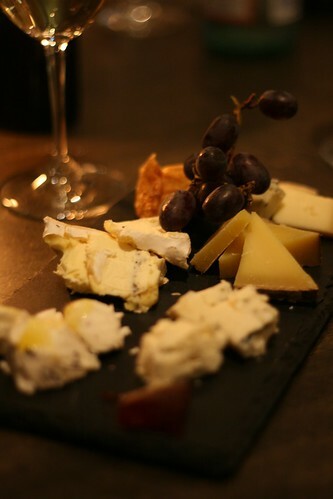 The hard Comté was also a delight. And at £12.50 for as much cheese as you can stomach, I think it’s a pretty good deal! Plus, if you want to take some home with you, all of the cheeses and cured meats in La Cave au Fromage are available to purchase. Bistro du Vin has it all. It is the perfect for meetings, a few cocktails with your girlfriends, a glass of fine wine with a work colleague or a special treat. Food For Think was a guest of Bistro du Vin.